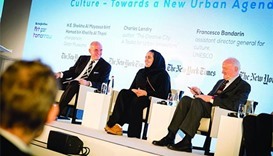 The second annual edition of The New York Times “Art for Tomorrow” conference was officially opened in Doha on Sunday under the theme “Technology, Creativity and the City”. The event is organised under the patronage of Qatar Museums and its chairperson HE Sheikha Al Mayassa bint Hamad bin Khalifa al-Thani. Speaking at the first panel discussion of the four-day conference, HE Sheikha al-Mayassa said the initiative to bring contemporary artists to Qatar is meant to inspire young artists to see what is happening around the world, and to be inspired. Art for Tomorrow will explore the many global influences shaping the creative infrastructure of nations and cities today, and apply this to the changing shape of Qatar’s arts and culture scene, the growing maturity of its creative community, and its development as a progressive and artistic hub. In so doing, the conference supports the position of Qatar Museums as the nation’s focal point for connecting cultures, encouraging cultural exchange and nurturing creative talent. In addition to the wide range of panel discussions, presentations and roundtables scheduled, the entire 29th floor of the W Doha Hotel & Residences has been transformed into a pop-up art gallery. The works on display are: Prince Nikolaos of Greece and Denmark’s Soundwall Exhibition; Sheikh Hassan bin Mohamed bin Ali al-Thani’s selection; Omar Khalifa (a locally based artist with his polychrome status), Pia MYrvoLD’s ‘Wands’, first generation smart sculptures and ‘Stargate’, an immersive video sculpture; Androulla Michael’s ‘Deconstructed Selfie’; Google Art Institute and their 3D glasses that allow visitors to enter an art gallery and zoom into any piece to see its intricate details; Laurence Winram, Scottish photographer with his Saatchi award-winning ‘The Watchers’, and a selection from ‘The Conemen’ series, and Ali Hossaini, with his Ouroboros: The History of the Universe. The conference will host a diverse range of speakers including a number of internationally renowned figures and cultural pioneers.